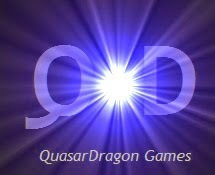 QuasarDragon: He Tasks Me. He Tasks Me, and I Shall Have his Free Fiction. He Tasks Me. He Tasks Me, and I Shall Have his Free Fiction. Some goodies to start the weekend. There will likely be more tomorrow or Sunday. "How do we know you'll keep your word?" - Kirk, "Oh, I've given you no word to keep, Admiral. In my estimation, you simply have no alternative. "- Khan Dave Singh. "There meant the place where our new friends lived. When people talked about them, you could hear something extra in the words. Like they were names: Our New Friends. Anton was trying to look forward to it, because it was good to make new friends, but he sometimes got nervous when there were a lot of new things, different things, to take in. But his mother said they all had to get used to things being different now, so he was trying. He was trying hard." At Every Day Fiction: "Clarice" by Martin Chandler. Horror. At 365 Tomorrows: "The Pit" by C.Chatfield. Science Fiction. At Weirdyear: "An Unexpected Reunion" by Madeleine Swann. 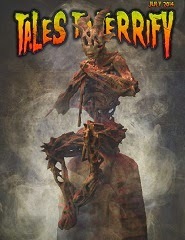 • At Tales to Terrify: "No 133 A. J. Huffman and Gary A. Braunbeck" Horror. "I have been, for most of my life, a collector of notes on subjects of great diversity—such as deviations from concentricity in the lunar crater Copernicus, to the great creature Melanicus and the super-bat upon whose wings it broods over the affairs of Man, as well as stationary meteor-radiants, the reported growth of hair on the bald head of a mummy, the appearance of purple Englishmen, instances of amphibians and blood raining down from the heavens, apparitions, phantoms, the damned, the excluded, wild talents, new lands, and 'Did the girl swallow the octopus?'" 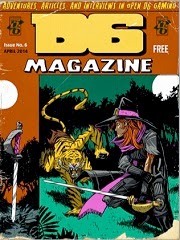 A free magazine filled with "adventures, articles, and interviews in open D6 gaming" Its been posted for awhile but I had missed it. Issues 1-5 are also available at the same location. At Diversions of the Groovy Kind: "The Vendetta" B&W Horror. At Pappy's: “The Beast” and “Killer’s Arms!” Horror. Gorillas. At The Horrors of it All: "Kiss to Save Him From the Grave!" (Parts One and Two). Horror.